The Scarecrowpress, Lanland 2007; 351 p.
I won’t be the only one whose curiosity is stimulated when one reads in Puccini’s biography that Leoncavallo composed a patriotic war time opera: Mameli. And I am one of the many who wonder why his last and posthumous opera Edipo Re is not more performed any more. After all it cannot be possible that the successful composer of Pagliacci, Bohème and Zaza had lost all inspiration. 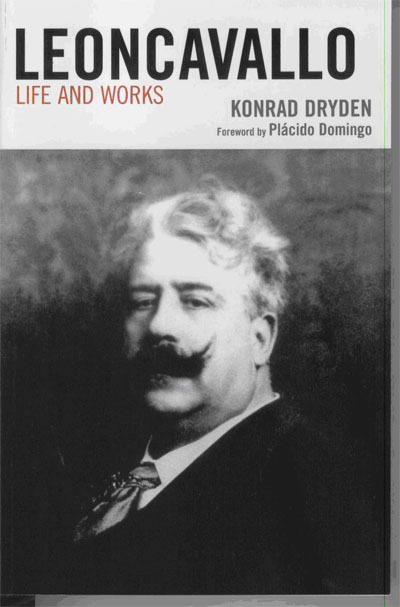 I’m glad to say that Konrad Dryden’s splendid book on the composer clears up a lot of questions while at the same time proving that Leoncavallo’s melodic vein had indeed run somewhat dry. That fine Edipo Re (listen to the CD with Giulio Fioravanti, coupled with a good performance of Leoncavallo’s Zingari) was not even composed by him. His widow paid another composer to concoct a new opera using the music of Der Roland von Berlin. Dryden didn’t find one reference to the opera in Leoncavallo’s correspondence nor is there a single note by him to be found in the handwritten score. And that Mamelli-opera is a rehash by Leoncavallo of his youthful Chatterton. It is one of the many similarities between the composers of the immortal twins. Mascagni too used his ideas of Vistula to present his last opera Nerone 40 years later. One learns that like Mascagni Leoncavallo too was an inveterate litigious person, always suing someone. And like Mascagni he was jealous of Puccini’s success; even more than Mascagni he ascribed every of his later failures to the influence of the maestro from Lucca and his publisher, Ricordi. Leoncavallo never couldn’t or wouldn’t accept that somebody very much inferior to him as to culture and knowledge of foreign languages nevertheless was more talented musically. Like Mascagni Leoncavallo had to look after a herd of family living on his costs. Finally, he too had very expensive tastes. But unlike the maestro from Livorno he hadn’t the gigantic amounts of money necessary for his high living: the difference being that Mascagni was a very successful conductor who asked and got the highest fees; earning more as a conductor than as a composer. Mr. Dryden has consulted all and every source he could find though even he has to admit defeat a few times when the sources have disappeared or are unclear, usually due to the many lies of Leoncavallo to aggrandize himself. Even Dryden cannot completely clear out the Bohème-controversy between Puccini and Leoncavallo. The author has admirably followed the composer’s path from his early poor days in Paris to his equally poor days at the end of his life; ridden by insurmountable debts so that one understands the widow who tried to cash in on his name by editing so-called unpublished Leoncavallo-composings up to twenty years after his death. Though Dryden has some sympathy for the composer he spares us no wheeling and dealing and one understands all too well why nobody in the shark world of Italian opera trusted Leoncavallo any more or wanted to do business with him. Nobody even thought of offering a teaching job to this querulous inflated ego. In the second part of the book Dryden discusses in detail opera by opera (detailed contents and analysis of music), operetta by operetta. He does so in acceptable language for those who don’t have a score in front of them. Happily Dryden doesn’t belong to the school of biographers that discovers an unjustly forgotten masterpiece in every odd title but he has high praise indeed for La Bohème and Zaza; fine operas which are so much better than most of boring baroque or modern trash. His analysis is a plea too for revival of some of the composer’s operettas; especially La Reginetta delle Rose and Malbruk. The only weak point in this section of the book seems to me Dryden’s scholarly refusal to comment on existing recordings which after all are the author’s best proofs for some of his assumptions and the only way most of us will get to know Leoncavallo’s worth. The Bongiovanni company has recently helped us by releasing the Pagliughi-Renzi-Reginetta (a must in every collection) and by recording Chatterton. But I Medici and Der Roland von Berlin too are easily accessible in the CD-R world of collectors. Even Pierrot Lunaire can be found. One word for those who try to order the book at Amazon. There is a foreword of one page by Placido Domingo and the cataloguing moron at Amazon probably recognized that name and decided to jut down the tenor’s name as the book’s author. After his amazing book on Zandonai this is a second highly recommendable book on a verismo composer. So, please Mr. Dryden, Umberto Giordano too could use your services.